I can get access to range lead to use for casting. My thought is that to make this work I need a way to test the ingots for hardness before final alloying and bullet casting. Does anyone here use range lead for your casting?If you do, have you checked the hardness. I would surmise based on a WAG, that the scrap I can get will be 40% .22, 40% Jacketed and 20% cast bullets. But that is nothing more than a WAG. I have seen BHN's for range scrap ranging from 6-10. But I trust you guys more than other internet posters. it is work. You do need to melt, clean, test hardness and alloy. It will run on the soft side once you get all of the sand out. Most of the jacketed bullets are almost pure lead. Did I mention getting all of the sand out? It is an indoor range, so I think there will be more dust than sand. I gave some Lino and some tin already. The tin is for alloying soft lead for BPCR. The Lino was given to me years ago. I have been buying precast and swaged bullets, most recently zero's. I can get good prices, but I figure that it doesn't hurt to have some extra lead around and that I can alloy the unknown lead for specific hardness. I process range scrap occasionally, I just did a batch a couple months ago at an outdoor Bullseye range, and took some pics. I don't do indoor range scrap, it has too much wood and backer junk in it, too much trouble for me. First I sift it though a hardware cloth to get rid of the dirt/sand. I do that at the range. I lose a lot of soft .22s, but thats ok. I made a bottom pour smelter out of a turkey fryer, it holds about a hundred pounds. Once I get about 25 pounds melted, I keep adding. I skim off the junk/jackets constantly that float up. And pour the ingots out the bottom. Also a little fluxing with saw dust stirred in seems to hold the alloys. Three 5 gallon buckets about 3/4 full rendered 215 pounds of pure ingots. I don't know what the hardness is, the finished bullets seem the same as the store bought ones, and shoot the same. I figured I got around 9000 bullets out of it. 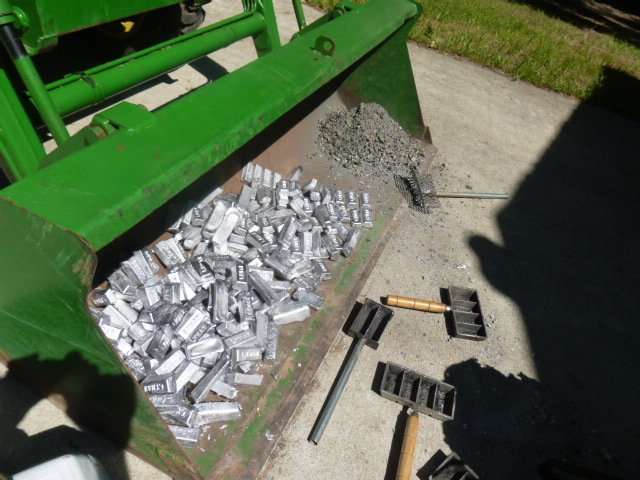 Here is a pic of the ingots, and the crap I skimmed off in the right side of the loader. Here is some cast bullets from them. I use a screen on site at the range to discard anything I don't think will be usable. Once fluxed, I discard the jacketed scrap and then use a Lee hardness tester to determine the BHN. I have shot a lot of cast and I don't go over BHN of 11 as there is no need. Look up the Los Angles Silhouette website, they specialize in discussing casting bullets. I use it for all my 45 casting. People who process it commercially report it runs about 2% antimony, which while not really hard will produce good usable alloy for low velocity pistol loads. Key to using any alloy is sizing, make sure you have a good fit in the bore and leading is not an issue. Use a similar system to KenO but my pot is the bottom half of a propane cylinder on a turkey fryer. After melting, skimming and fluxing I use a ladle to pour the lead into aluminum muffin tins. Have probably processed over a ton of lead this way. You can harden it more with your lino if you want to but I have not found that necessary. NOTE: I am loading SWC bullets in the 190-215gr range at about 750fps so if you re pushing for full velocity you may want them harder, but try a few first and save the lino for when you need it. If your processing from a shreaded rubber backstop, don't do it in your front yard, the neighbors will wonder why your burning tires... other than that, cast coat and shoot. I appreciate all of this advice. The Bullseye braintrust comes through once again. I've run tens of thousands of Range Scrap bullets through my 45's, 41 mag, 38 sp. Unless you sweeten it with a bit of tin or linotype, it comes out at 8-9.5 BNH. Just about perfect for Bullseye velocities. 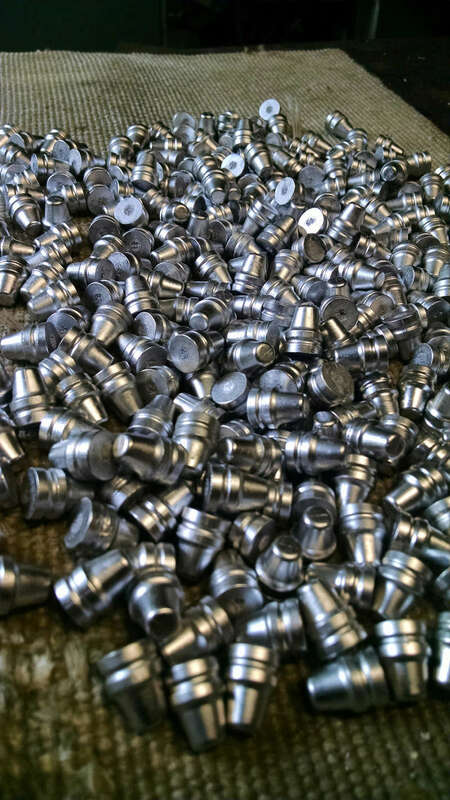 Your bullet quality and accuracy will totally depend on your casting and sizing techniques. Seeing comments from others gathering from outdoor ranges, thought I should mention my source is all from our indoor range. Other than an occasional piece of cardboard or target, it's all range scrap-no dirt or sand. Personal experience: range scrap is GREAT. When first bought some back around 1979, I found the alloy didn't fill the mold very well and I had to add a little type metal. This upped the tin content and casting was perfect. The only problem was the amount of sand and junk that was included—they filled the buckets for you and you took what they gave you. However, for the price, I didn't care. In over 40 years, I NEVER needed to know the BHN. I can't speak for the past, but currently, all the companies I contacted that would say anything use 95/5 or 94/6 alloy or 92/6/2 alloy for ALL their swaged and jacketed bullets (Hornady is the one that doesn't use antimony in their swaged bullets). I have no idea what alloys are used in .22 LR. These are all perfect alloys for any lead bullet I have ever used from .32 S&W to .30-06 (though, I do use gas checks for any use above 1800 fps). The whole idea of pressure/alloy is that an alloy that is too hard will not expand to fill the bore (obturate), so you need an alloy of a certain hardness or softer that can expand or use a larger bullet. I go with the larger bullet. In the real world, I find that alloys from 8-15 BHN do well if they are at least 0.001" over actual groove diameter and the type metal (what is now "hard" at 18-22 BHN) alloy almost always needs to be at least 0.002" over actual groove diameter (or you need to be hooting them at 55ksi or higher so they can expand). Now, we not only have Lee Liquid Alox (a great way to prevent leading with undersized bullets) and coated bullets (which appear to be a DIY project for many), so specific alloy or hardness is even less important. Remember, Keith developed .44 Rem Mag with an alloy of 10-12 BHN and never complained about leading. >Your bullet quality and accuracy will totally depend on your casting and sizing techniques. Or, you can eliminate sizing entirely and you'll probably see a slight improvement in accuracy. If you simply have to size, get a push-through sizer (Lee, Star, or such). I HATED my Lubri-Sizer and somewhere in the early '70s there was an article about NOT sizing your bullets. I tried it with 9x19, .45 Auto, and .44 Rem Mag and the unsized/as-cast bullets were either as accurate or noticeably more accurate than my sized bullets, so I started to hand lube my rifle bullets and pan lube my pistol bullets. The only use for the Lubri-Sizer was with slightly over-sized sizing dies to swage the gas check onto the bullet. I gave up on it. I only got about a 50% yield- too much dirt in the mix. Be sure to wear a good filter when handling the dry scrap. I got an elevated lead blood level when I didn't. I had lead analyzed from a local scrap yard from a range that sounds very similar to what you are describing. I add 1-2% Tin and shoot it. I lube with white labels BAC and get no leading. Target loads, indoor range scrap as is. For mag add some linotype. If alloy is to soft, 45 acp nose may drag on feed ramp, deforming bullets. If bullets drop from the mould undersize, add linotype. The antimony makes for a larger diameter bullet. Used indoor scrap for about 30 years, never tested hardness. Was given 2 40 lb ingots. They were the softest ever, caused the feeding problems. Adding linotype fixed it. SMBeyer wrote: I had lead analyzed from a local scrap yard from a range that sounds very similar to what you are describing. Here are some more results using a very expensive analyzer. My range is an outdoor public/member range FWIW.